A classic effect with an LED Twist! 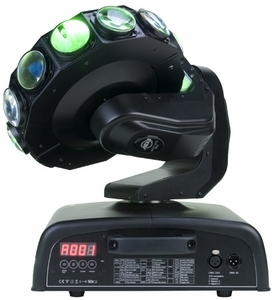 The Accu UFO Pro - a member of the acclaimed American DJ Accu Series Intelligent Lighting Effects - is a unique moving head effect that features 32, 1-Watt red, green, blue and white bright razor sharp LED beams that twist, turn, strobe and pulse. The Accu UFO Pro will run using a DMX controller or let it move to the sound of music with it�s exciting built-in programs. The unit has two different DMX Channel Modes (8 or 10), and offers smooth microstepping from it 1.8 degree Stepper Motors with 8-bit or 16-bit movement. Utilizing LED technology, the Accu UFO Pro requires very little power to operate (only 100W max) , can run all night long with no duty cycle and requires low maintenance with it�s LEDs rated at 50,000 hours. � Weight: 30 lbs. / 13.5 kg.